Fresh okra on a wood surface. Okra has become synonymous with Southern and Cajun cooking. Many people think of okra as being a uniquely American vegetable, so you may be surprised to learn that okra was brought to America by African slaves. The edible pods are the immature seed pods of a plant that is related to the hollyhock, hibiscus and rose of Sharon. Whole, fresh seed pods can be cooked in a number of ways, but the two most popular ways to cook whole seed pods are steaming or sautéing. Okra can be served alone, or with ham, chicken, seafood, grits, polenta or rice. Wash the okra under cool water to remove any dirt or debris. Scrub gently with a clean cloth, but be careful not to break open or bruise the pods. If the okra breaks open it will release the mucilaginous ingredient inside the pod, which will make the okra slimy. Place the okra pods on a steam tray, and put the tray in your vegetable steamer. If you are using an electric steamer, read the manufacturer's instructions for use, as each brand of electric steamer is slightly different. Typically you will fill the bottom portion of the steamer with water and place the okra in a specially made steam tray on top. If you do not have a vegetable steamer, bring 4 cups of water to a boil over high heat on the stove. Place the okra inside a mesh or bamboo steamer and carefully place the steamer over the pot. Then, place the lid on the steamer. 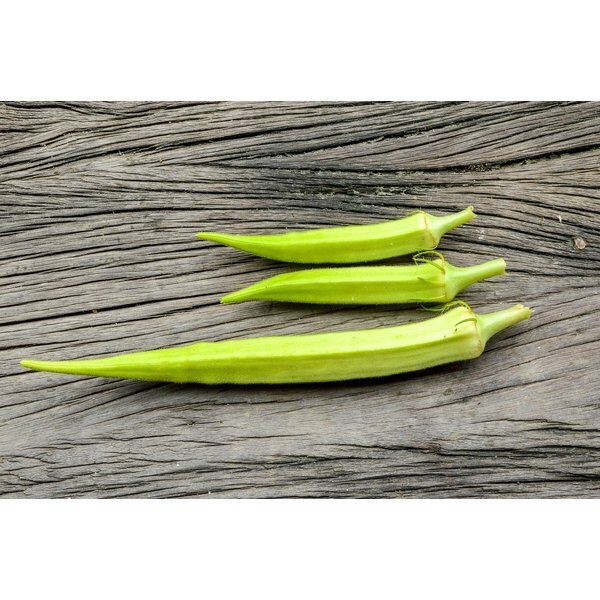 Steam the okra pods for 3 to 6 minutes in the bamboo or mesh steaming basket on the stove. If you are using a vegetable steamer, use the "High" setting, if your steamer has adjustable settings. 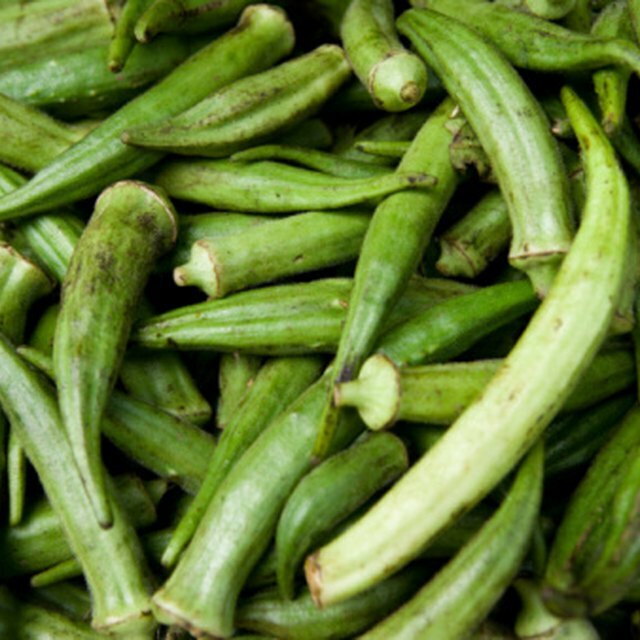 Most electric steamers will cook the okra at the same speed as a steamer basket, so you can expect your okra to be finished in 3 to 6 minutes. When the okra is ready, the okra pods should be cooked through but still crisp. Remove the okra from the steamer or steaming basket and season the okra with lemon juice, lime juice or vinegar for a tangy finish. Wash the okra under cool water to remove any dirt or debris. Scrub gently with a clean cloth, being careful not to break open the pods. Heat the olive oil in the skillet over high heat. The oil will begin to bubble and crackle slightly when it is hot. Add the okra and sauté, stirring occasionally, for 3 to 5 minutes. For extra flavor, you can also add one medium sliced red onion before you add the okra, stirring until the onion begins to turn translucent. Alternately, you can add two sliced red peppers, four minced cloves of garlic or 1/4 teaspoon of salt at the same time as the okra. When the okra is ready, the pods will be a deep green color and tender enough to easily pierce with a fork. Remove the okra and other ingredients from the pan with a slotted spoon and serve hot or over grits or polenta for an authentic Southern dining experience. Avoid placing your hands or face directly over the steam, because hot steam can cause severe burns. Don't sauté okra pods in a skillet that is made with aluminum or cast iron or the okra will turn to a green that is so dark it is almost black. What Is the Best Way to Cook Okra?